Chrysmium is just one of the many towns that exist in the world of Zenith. The town serves as the largest port between Khorhaldrum and Tria Regna. Although the town itself occupies the North West of Khorhaldrum, its size does not span across a large area. However small it may be, it still proves itself to be a mighty settlement with its mountainous terrain. Beneath these mountains lay a multitude of endless caverns that bleed a steady flow of silver from their veins, waiting to be chiseled out by the pickaxes of prosperous beings. Its existence is vital to the Mountain Dwarf race, as it contains a very large deposit of the sought-after Chrysmium Ore. This type of crystal ore provides a hardy source of income for the settlement. The town of Chrysmium eloquently boasts the recovery of the largest Chrysmium crystal ever found, which is seen on display in the town’s market square. This crystal represents the energy and spirit that thrives within the port, giving the Mountain Dwarves hope for future triumphs for their endless mining efforts. It is here, at this very port, where the journey begins for our build team. This build includes over 1,000,000 blocks! Arcadia is seeking talented builders who wish to refine their skills while becoming a part of a close-knit community that is filled with an energetic and innovative atmosphere. 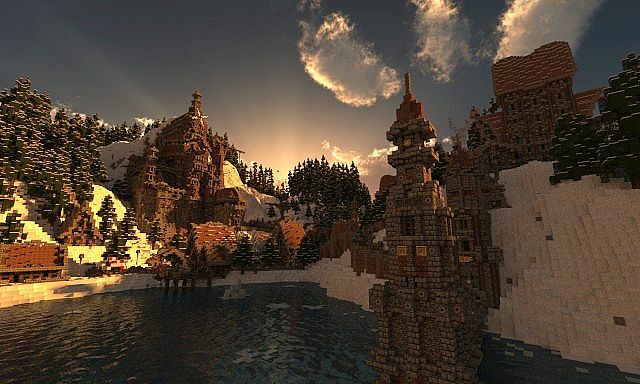 If you are a builder who takes interest in various types of fantasy-styled builds, organic builds, or terraforming, this is the place for you! We are currently working on a massive project that is already over a year in the making. If you wish to become a part of this project, please follow the instructions on our forum. Callum_Replay? I just added you on skype? 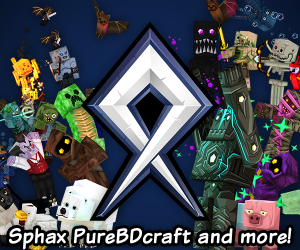 You have been featured on Pixelhive! There are no words for this. Just amazing. It's part of a colossal project, so unfortunately no download. However, stay tuned and you'll surely be amazed at what we have to share. This thing is freaken awesome with the lava and all the buildings. SO COOL! Looks good! Is that a 1.7.2 map? What shader mod did you use? That I knew, but what shader mod? I really like this, looks like a good amount of effort has been put into it. Nice job guys! We appreciate it, wait for our next build. Chrysmium is nothing compared to what were working on now. Made me poop so hard, that i came. Thanks! However, the build is part of a colossal project that will be released in full as a server when finished. Expect bigger and better than this in the future! :D Epic cant wait for that! I know it's 'dwarven' but the architecture doesn't look really dwarven to me. just a thought. Original content is hard to craft anymore in this medium, we strive for impressing ourselves. Thank you so much! Wait for whats next, if you think this was a nice build.. This is a wonderful build. I love and wish i could use shaders with the mac, but mac is inferior to the PC. Anyhow, i would like to say keep doing what you are doing! Incredible! Glad to see new people making a splash in the community! Keep up the great work, guys! wow, i subbed i would love to see more. My only constructive criticism is to maybe add a few more towers to that castle like structure? And maybe more grandeur and more focus on larger buildings. Other than that you did an excellent job! Very cool! Keep it up! Got some neat stuff goin on i see :D it looks pretty damn cool! diamonds! The lighting on your cover image is very off though... Perhaps it should have been taken when the sun was at the other side of the horizon, so the light of your sunrise/sunset casted some more realistic-looking lighting. We tried that Azie, but the build looked very dark with it, so we chose to sacrifice the realism for something that makes the build more easily seen.